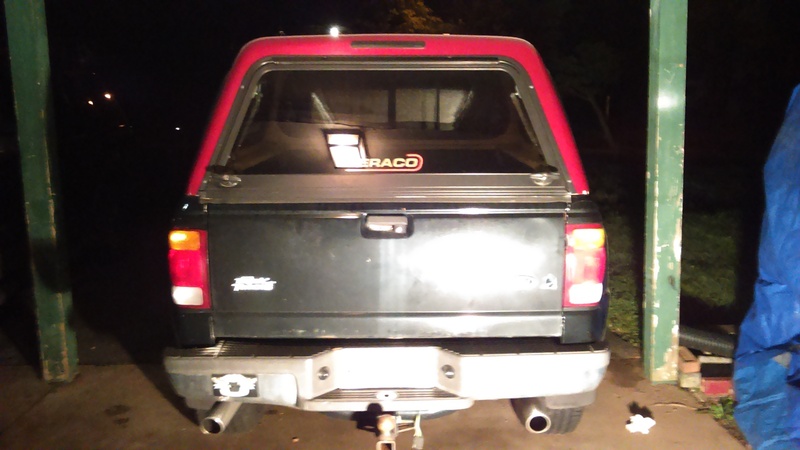 I have a question about the 3rd brake light on my new(used) cap. Currently the wires have been cut almost completely off at the light housing so i would have to rewire that somehow and the last owner decided to spray paint black over it on the outside. Should i attempt to fix this light or look for another to replace it? Other question is about the cargo light. I was thinking about wiring it into my left rear turn signal because i have the one with a separate amber for turning. Was going to use the parking light wire for the cargo light (Brown i'm assuming) and then the main brake light wire for the 3rd light (Lt Green i think). Is that a good idea? or should i run wires from somewhere else? Yes, you can use the brake light wire to power the canopy's brake light. Cargo light is something else, there are a few options. I have mine hooked up to full time power(fused), so I can turn the light on and off from a switch on the cargo light in the canopy, this is better for my purposes/uses. But battery could be drained if left on, never happened to me in over 20 years with different vehicles but could happen. Some, if not most, Rangers have a Cargo light on the Cab's 3rd brake light, lights up the bed, this is activated same as turning on the Dome light, main light switch dimmer turned clockwise all the way. You could tie into that circuit. Yes you could use parking light wire, it is a fused circuit, like brake light wire, you would have to have Parking lights on of course, to get cargo light on, and cap light would stay on unless it had a switch. You do need a 3 wire connector, brake light 12v, cargo light 12v and ground, they can share the one ground, you use a connector so you can easily remove canopy. Last edited by RonD; 06-01-2016 at 05:03 PM. Thanks for the advice RonD. Out of all the options i'm still leaning towards the parking light power source because of its power drain protection and mine does have a on/off switch, but i do see the benefits of having one that can have a available power source for times you really don't want all the lights on. In the future i will probably add a second battery into the bed for separate power to it an for other accessories like fans if i ever outfit it for camping. I really would like to replace the brake light if i can find something that fits i do not want to have to modify the existing holes. I'm going to attempt to contact the company and see if they still sell ones that can fit. i measured the area of my light thats still installed it was like W 10.2" H 1" on the outside. Will that one i found fit ok? i can use some RTV sealant or something around its edges if there is any gaps. Last edited by Akuma; 06-01-2016 at 08:53 PM. Ranger Cap vs. S10 cap?